The Raw Vegan Anti-Cancer Super Anti-Oxidant Smoothie! This recipe was given to me as part of my Anti-Cancer Diet by my Naturopath John Smothers and I drank it nearly everyday, usually as an afternoon snack. Surgeon Generals Warning: Highly Addictive Deliciousness. I buy a case of nine for around $12 at a local Asian market. 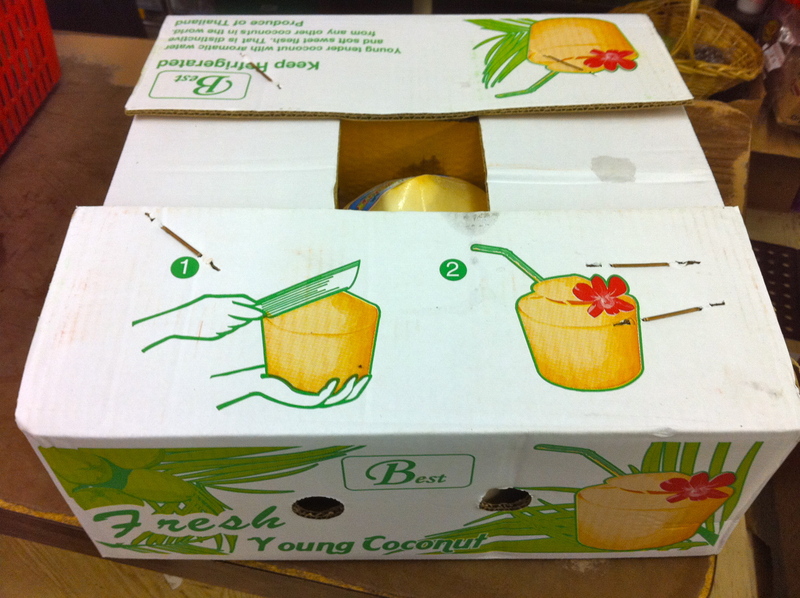 Make sure you ask for “Young Coconuts”, they are much softer and easier to cut than fully mature coconuts. I love Asian markets. It’s like stepping into a strange world. The shelves are filled with weird products and food you will never see anywhere else; all written in a language you can’t read. So be prepared. Also the employees may not speak English very well, if at all. Lots of nods and smiles. The Chinese market I frequent keeps cases of coconuts in the back freezer. I always ask someone to fetch me a case from the back because it’s easier than trying to carry nine coconuts in those little hand baskets. I buy them prepackaged in the frozen section of my local Whole Foods Market, and you may find them at conventional supermarkets as well. They usually contain blueberries, raspberries, blackberries, and strawberries. The frozen banana makes it sweet, thick, and frosty like adding ice cream would. CAREFULLY insert the blade straight down with a stabbing motion into the coconut, then make a sideways cut about two inches long. Repeat this 4 to 6 times working your way around the top of the coconut connecting the cuts until you can easily remove the pentagon-shaped top. Pour the coconut juice into a blender. Scoop out the white coconut meat with a spoon and put it in the blender. Blend the juice and meat together. Congratulations! You just made coconut milk. 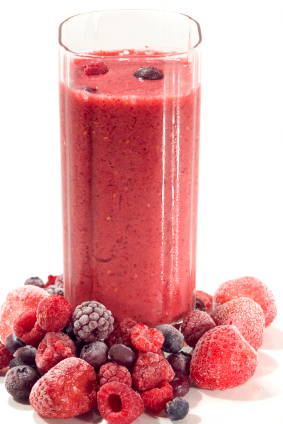 The last step is to blend it all together and enjoy a delicious, super healthy, anti-oxidant, cancer-fighting smoothie! Note: Rice milk or canned coconut milk will substitute in a pinch, but isn’t as good. Peel a bunch of ripe bananas and put them all in a freezer bag. Some people individually wrap them. I think it’s too much trouble. You can also put a kabob stick in them and eat them like a popsicle once they’re frozen, which is a great healthy alternative to popsicles. Hey parents! Kids love frozen bananas. Another cool thing you can do is run a frozen banana through a Champion Juicer and it makes banana “ice cream”. Blender Tip: Some blenders just can’t handle frozen bananas. But the Vita-mix is a commercial blender that will destroy anything in its path. You can even make your own nut butters in it. Most Smoothie places use them. I swear it will turn rocks into soup. Highly recommended. If you’d like to see my coconut skills in action, I made a how-to video you can watch HERE. You also might like my related posts on Juicing and The Cancer Fighting Salad. As for juicing can I use a blender until I get a juicer? Yes you can use a blender, the difference is that a juicer separates the juice from the pulp which makes it easier for your body to absorb. With a blender you’re basically going to make smoothies. I saw your web site via msn the other day and absolutely love it. Keep up this fantastic work.